SUNNYVALE, CA--(Marketwired - Jul 15, 2014) - Fast growing content discovery service Flipora has recently launched its version 2.0 with several outstanding new features. Co-founded only a few years ago by Jonathan Siddharth and Vijay Krishnan, the recommendation engine has quickly gained in popularity as the company is getting closer and closer to its current goal of reaching the 30-million-user mark. It has been an eventful year for Flipora with the company rolling out an API for its personalization technology, expanding to 10 new international markets by translating the service, releasing an improved recommendation engine and a completely new visual redesign. The basic principle stays the same: A Web-based content discovery service that makes personalized suggestions to users, depending on their interests. Flipora utilizes state-of-the-art artificial intelligence and machine-learning technology in combination with the Web browsing history to intelligently and automatically learn about the likes and dislikes of its users. So what's great about Flipora 2.0? The new version of the recommendation engine takes into account the user's current mood and recent interests while deciding what content to recommend. This is possible thanks to Flipora's algorithms that automatically learn a user's interests and then recommends content to them that is both interesting and timely. Flipora's content recommendations are based on what other like-minded users with the same interests have found interesting recently. "With this new version, Flipora learns your current interests, and stays on top of your evolving interests -- automatically. Flipora knows what you're currently in the mood for based on your web history and then makes recommendations that bring you the best of the web. This is a level of up-to-the-minute, context aware discovery that has never before been seen in a product," explains Jonathan Siddharth, Flipora Co-CEO. 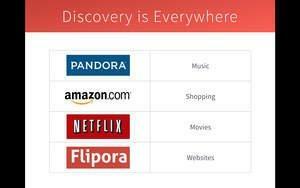 Vijay Krishnan, Flipora Co-CEO adds, "The new Flipora now offers 3,000 interests that a user can follow. This also lets the personalization be that much more fine-tuned. Expect more interests to come soon." The Flipora browser extension, which is available for all major browsers, also received a big update. It now features a cool slider widget that slides out from the corner of the user's browser, offering a great website recommendation based on the user's current mood. And the user-friendly layout does not end there: The entire visual design of Flipora 2.0 is brand-new, with some exciting new features presented in a beautiful, modern and clean user interface. This is the biggest visual update to the service since it launched in 2012. Flipora is an A.I. based content discovery service that automatically learns your interests and then recommends content to you based on what you are currently in the mood for. Today, content discovery is broken and left to chance on Facebook and Twitter. Facebook and Twitter don't know what you are currently in the mood for, and so you largely see boring and generic content, driven by what your friends want to share and not what you want to see. Flipora puts the emphasis on you and what you are in the mood for right now and recommends content based on your current interests. Flipora is the world's first mood-aware content discovery service. Starting out of Stanford University, Flipora.com now has nearly 30 million users and has raised Venture Capital from some of the best investors in Silicon Valley, with prior successes such as PayPal, Twitter, Skype, Tesla, Baidu, and Hotmail.